The second-biggest and second-prettiest and second-most-touristy town of the Salzburg province is often called "Little Istanbul". This is due to the large paper factory and other industries of Hallein, which attracted large numbers of immigrant workers, mostly from Turkey and former Yugoslavia. 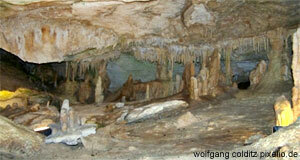 However, the crowds usually come for other attractions: Mostly for the salt mines - Hallein is the place where they are. These mines gave half the name to Salzburg ("salt castle"), made it rich and famous and are now one of the prime attractions of Austria. Used ever since Celtic times, they are no longer used for mining ever since 1989 (Ebensee is the only active salt mine in Austria), but commercially exploited by opening them to guided tours. The "Hallein Show Mines" - despite of their tacky name - are indeed a great attraction. Easy access from the city of Salzburg and a safe bad-weather-alternative to outdoor activities, they are extremely popular among tourists and locals alike. I recommend a visit especially if you travel with children. The tour starts from the entrance point at Mount Dürrnberg, which you can get to either by car, bus or cable car ("Salzbergbahn"). In the entrance area, you will receive white over-alls that should protect you against dirt in the mines (they are actually pretty useless, since you won′t dig in dirt anyway, but good fun). Then you will mount on the "Grubenhunt", a small train that takes the visitors to an assembly spot where you will watch a video on the long history of mining in Hallein and the importance of the industry for all of Salzburg. The video is in German, but subtitles in all sorts of languages are available. The tour itself continues in German and entertaining English and includes an underground lake, a creepy display of a salt mummy (a replica called "Man in the Salt") and two wooden slides, of which the longer stretches over 40 metres. A small museum ("Keltenmusuem") finishes the job alongside with bad-hair-day-figure displays of historic scenes related with the mines′ history. The whole package isn′t cheap, but well worth the money. Around Mount Dürrnberg, you will find many routes that make rewarding hiking destinations. For details, get a decent hiking guide or ask in the local tourist information centre for recommendations. For even more action, you should take a chair lift of the "Zinkenbahn" (or hike up the mountain like a real Austrian) and ride it down on a "Sommerrodel" ("summer toboggan"). This device works on a rail and allows you to race down the mountain in a sledge-like device at an evil speed - great fun, again. The "Sommerrodelbahn" on the Zinken claims to be the longest in Austria - in any case it surely is among the most scenic. Continue your "Celtic experience" back in the main town of Hallein in the valley. The town museum displays some of the ancient finds dug out at the still ongoing archaeological excavations from Mount Dürrnberg. Here you will also understand why Hallein became such an important centre of trade: not only the salt, but also goods from Germany and Italy, wood and other items were transported along the river Salzach. The merchants of Hallein became wealthy people, which is reflected in the beautiful patrician′s houses in the historic city centre. Today, Hallein′s "Pernerinsel" island contains one of the stages used for the Salzburg Festival. Visitors keen on sightseeing, however, are better advised to spend their time strolling in the region of the Unterer and Oberer Markt (upper and lower market), the Bayrhamerplatz and the Kornsteinplatz. Specialist-interests might lead you outside of the city to the Kaltenhausen brewery, famous for its mild, malty "Bernstein" beer (Bernstein means amber, a reference to the colour of the beer - despite of amber coming in pretty much any colour beer could have plus some shades of blue) or to the river Salzach, from where you can cycle to Salzburg (approximately 20 kilometres). For an in-depth experience of Hallein including some hiking, the show salt mines, the Sommerrodelbahn, museum and the city, you might want to spend two days or even more - otherwise, more condensed versions will give plenty of opportunities for day-trips from Salzburg.